At A1 Sewer and Drain, cleaning sewer lines in New Jersey is a major part of our plumbing jobs. As a local NJ sewer cleaning and sewer repair services company, we provide sewer jetting services to safely and effectively clear out debris from your sewer line, eliminating clogs and restoring the flow of wastewater away from your house and into the municipal sewer system. Sewer jetting services are the latest technology to clean your drains thoroughly, not just pull out clogged material. Sometimes when you have build up in the walls of your sewer pipe, it can cause debris to stick to it and thus build up easier into a clogged drain. A snake will remove the clump of debris causing the clog but the build up on the walls of the sewer pipe will remain. Sewer jetting can also break up tree roots and hard debris that is blocking the sewer pipe. We have used sewer jetting many times to clean a clogged sewer pipe in NJ, call us today for experienced service. 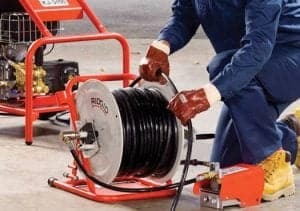 Sewer jetting services are a method of cleaning sewer lines that uses water at very high pressures, much like a pressure washer. The high-PSI streams of water act like a cutting tool, slicing through invasive tree roots and pulverizing sediment and organic debris. The broken-up material can then be safely washed away downstream through the sewer. Before in order to remove tree roots we would have to dig up the pipe and open it up and remove the tree roots from the sewer pipe manually. Today with sewer water jetting its much easier and faster to remove tree roots in the sewer pipe with the high pressure jetter. There are many reasons that your sewer main line might become blocked off and require professional sewer cleaning in NJ. Some of these things are easy to clear and some are more difficult. Sometimes you can have tree roots blocking the line and using a snake you can clear any hair or other debris stuck to the roots and thus clear the blockage. But the tree roots will remain in the line and continue to grow, sometimes breaking the sewer line itself, which leads to a much bigger and more expensive job of sewer pipe repair or replacement with sewer replacement contractors nj. If a NJ homeowner has more than one clog in a year, he should pay for a sewer inspection with a sewer video camera. This is relatively inexpensive and will tell you exactly what your problem is. So if its tree roots you can clear with sewer water jetting before they grow to the point that they damage the sewer line and require costly sewer repair. Tree roots that have grown into the sewer pipes. Trees love to grow into sewer pipes, which provide moisture and nutrients that attract them. Once they’ve gotten in, large roots can block off part of the sewer line, leading to a clog that needs to be removed with sewer jetting services. Built-up sediment on the bottom and sides of the sewer pipe. Water often carries minerals and sediment with it, which can gradually be deposited along the pipe, narrowing it and obstructing water flow. Flushed paper materials like paper towels, feminine products, and facial tissues. While toilet paper is designed to disintegrate easily when exposed to moisture, the opposite is true for many other paper products. Flushing a lot of paper towels, kleenex, or feminine hygiene products could potentially cause a clogged sewer line. For whatever reason your sewer is clogged, we can help you unclog your sewer in a quick and affordable way, saving you a lot of hassle. At A1 Sewer & Drain, cleaning sewer lines is our job. For professional sewer repair, sewer cleaning, sewer jetting services, and more, call us today at 201-645-0888 for 24-hour sewer services.